Back in March when I noticed a bunch of the baking bloggers I religiously read were all making red velvet cakes, I begged to be included in the group! 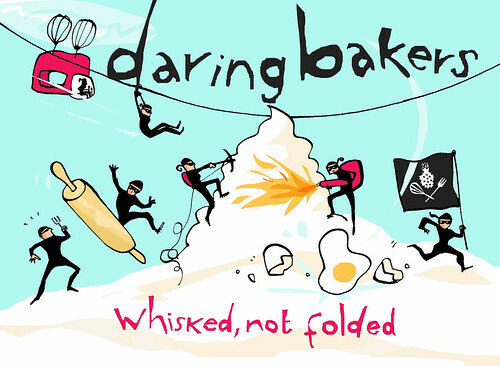 This month Daring Bakers has grown to 48 members, all attempting the same challenge. 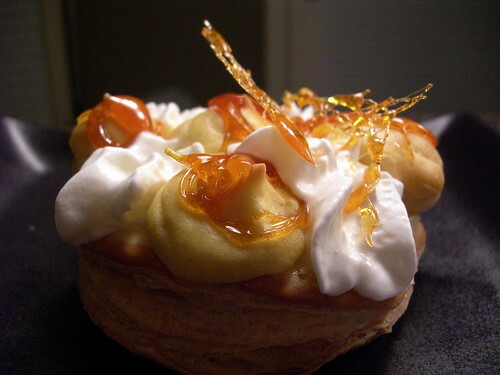 This month's challenge was Gateau St. Honoré, in honor of the birthday of St. Honoré, the patron saint of bakers. This pastry is often used as a final exam for pastry chefs, since it includes puff pastry, cream puffs, cream, caramel, and spun sugar. You can read more about the recipe and look at other bakers by clicking on Helene's post - she was one of the two hosts for this month's challenge. I was overwhelmed by this challenge. Last week I had talked myself out of it completely, but let myself be talked back into it. I did take the out of buying storemade puff pastry, but everything else is mine. I had never made cream puffs before, so that was neat to see how easy it is! All of my cake decorating supplies are still in the closet of my old bedroom in my parents' house in Oregon, so I had to improvise with spoons and ziploc bags, but it worked just fine. I didn't start until today, and it was due today, whoops. Normally I would have taken my time but I had psyched myself out about it. 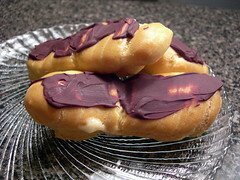 With my extra dough I made some eclairs. I have no idea what I'll do with the bowl of cream I have left over, but some bakers have done some creative things including turning it into icecream! There were a few casualties - I had a saucepan I was ready to throw away, so it was sacrificed to the caramel. I know I could heat it back up and retrieve the pan, but it was ready to die anyway. I did burn my finger on the molten caramel, and smartly (not) stuck it in my mouth, burning my tongue as well! Other than that, things went fairly smoothly. I'd like to eventually make puff pastry from scratch, it just wasn't going to happen this month. 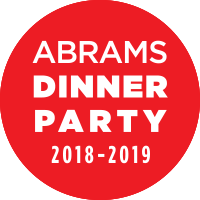 I attend a potluck type dinner every month with a bunch of friends/co-workers, and each month has a different theme. This month's International Dinner Group theme was Mexico, and I didn't see how we could have a Mexican meal without a tres leches cake! 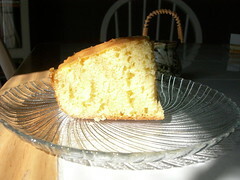 I have quite the history with tres leches cakes. When I worked as a cake decorator for a upscale supermarket in Indiana, I would get in trouble from the assistant manager because I would refuse to make tres leches cakes for the case. They were a lot of trouble, and nobody ever bought them, and we were always swamped with orders. So tres leches cake had an unhappy history in my mind that desperately needed correcting. I surfed the internet for a recipe and ended up making a variation of the one on the Betty Crocker site. I am not ashamed to use cake mixes as a basis for a good cake - it's just the dry ingredients. It's what you do with them that matters. I read a lot of reviews and took some of the ideas into consideration. This needs to be made the day before serving. Please plan accordingly. 2. In large bowl, beat cake mix, water, rum, oil, vanilla and eggs with electric mixer on low speed 30 seconds, then on medium speed 2 minutes, scraping bowl occasionally. Pour into pan. 4. In large bowl, stir together sweetened condensed milk, whole milk, rum, and whipping cream. Carefully pour evenly over top of cake. 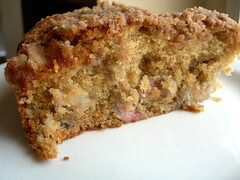 Cover; refrigerate about 12 hours or until mixture is absorbed into cake. 5. 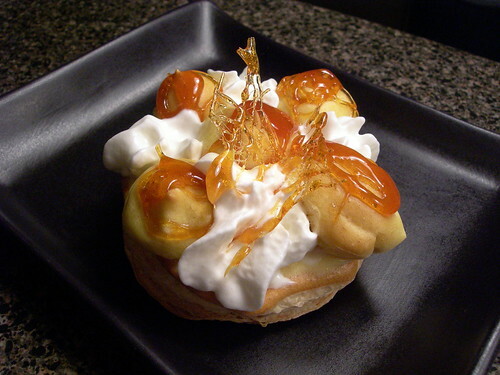 Serve with whipped cream and fresh fruit. Jenny's notes: Okay, so originally tres leches cake doesn't have rum in it, but the Cuban version definitely does, and I think it adds a lot of flavor to what would otherwise be just a super sweet cake. You can leave it out, just sub water in the cake and milk for the three milks mixture. The original recipe said to soak for 1 hour, but 1 hour is not long enough - you'll just end up with a soggy half soaked cake. 12 hours is optimum. What you should end up with is a sweet, light, delicious cake! I have to be honest, I liked this more than I expected to. I get home from a faculty meeting that almost hit the three-hour mark. I am exhausted. Since I am already home almost an hour and a half later than usual, I decided not to stop at the grocery store. I go to the fridge - not really anything to eat, other than eggs which don't sound good at all and leftover pasta which I ate for lunch. I go to the cupboards - wow, I need to do some shopping, but at least I have cans of soup. Soup, what goes well with soup? Biscuits sound amazing, but I'm not sure I have the energy. But somehow over the weekend we have consumed all the bread and crackers in the house, and soup alone probably won't cut it. I dump the dry ingredients into a bowl, and lightly mix them. The powder feels soothing to my fingers. I dice the margarine before dumping it into the bowl, distributing it with my fingertips, just until the mixture is a fine crumb. I raid the fridge for milk and decide on buttermilk that is about to expire, and swirl the right amount into the bowl. At first I lightly mix the dough with a spatula, but soon abandon it for my hands. I mix, I knead, I roll, I cut - and the biscuits are ready on a greased baking sheet before the oven has finished preheating. I realize the exhaustion has left me, and I feel exhilarated. A can of soup alone is so lonely. 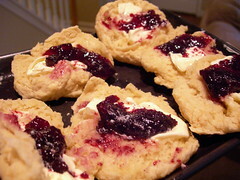 A can of soup accompanied by fresh homemade biscuits with delicious jam is comfort food at its best.